A perfect day in Ho Chi Minh is here. This day trip will take you back in the history of Indochina conflict. Walk through the underground tunnel system that played a crucial part in the war. Imagine and feel the thrill and difficulties the people faced to live and survive. Halong Bay is one of the most breathtaking natural landmarks in Vietnam. This weekend break is the best way to explore this beautiful destination. Halong Bay is located 180 Km east of Hanoi. Day trip to Halong Bay gives you an opportunity to have a great experience. The tour also comes with famous water puppet show in Hanoi. 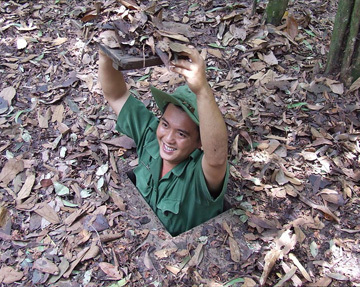 Leave the hustle and bustle of Ho Chi Minh City behind and head to the countryside for the Cu Chi Tunnels. Please reach at Central Post Office by 7 am as the coach will depart at 7.30 am. The tunnels were built by local fighters during the Indochina conflict as a base from which the Viet Cong could secretly operate from close to the Southern Vietnamese capital. Initial construction started in 1948 when the Viet Minh required a place to hide from French air attacks. By 1965, the complex was estimated to have 200 km of tunnels. It included, hospitals, schools, meeting rooms, kitchens and sleeping quarters. To protect against outside intruders booby traps were laid throughout the complex. Before arriving at the tunnel meet local people and get an insight into life in the area, past and present. The local guide will take you on a fascinating trip underground to learn more about the conditions the people lived in, the hardships they faced and the amazing skills used to make the tunnels habitable. Return transfers to Cu Chi Tunnels by air-conditioned vehicle. 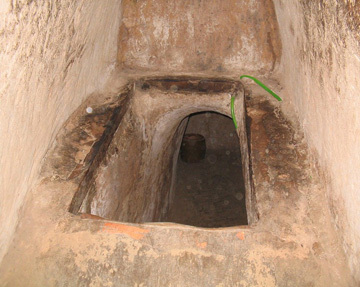 Entrance in Cu Chi Tunnels.